The Maker Movement continues to grow, and makerspaces have hit a point where they are clearly no longer just a passing fad. Academic universities are conducting research and gathering data on makerspaces’ impact on learning, and dozens of books have already been published. More and more makerspaces are being created in schools, some in separate labs and some in corners of classrooms. And some makerspaces, of course, are in the library. In these last four years of speaking at conferences, chatting on Twitter and talking to colleagues, I’ve fielded a lot of questions from two camps. One camp is made up of hesitant librarians. They’re not really sure that a makerspace belongs in the library. They’re afraid of it taking over their whole program and replacing the books. Their school already has a STEM lab, so why do they need a makerspace in their library too? The other camp is made up of librarians who are ready and eager to start a makerspace, but who are meeting resistance from their administration. 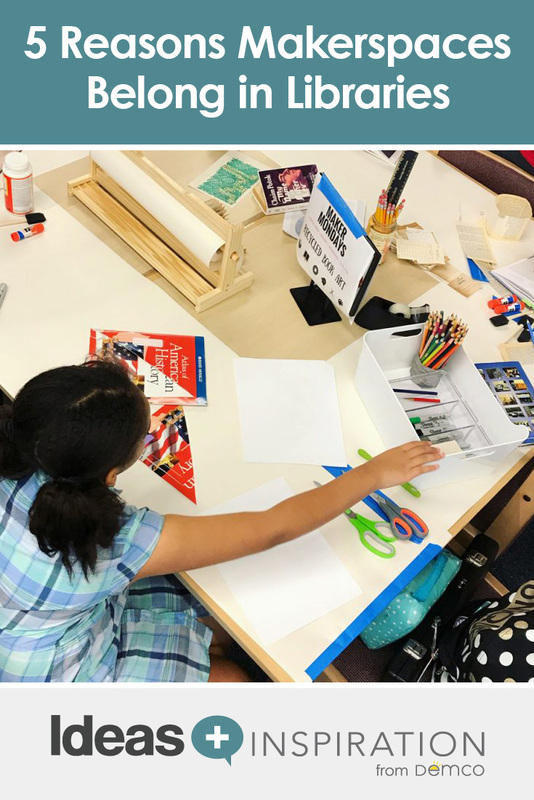 We already have an art studio; why do we need a makerspace in the library too? Aren’t those kids just playing and messing around with LEGO® bricks? Shouldn’t the library be a quiet, clean, studious environment? How would a space like this tie in with curriculum, improve test scores or create better experiences for our students? This article looks to address some of these concerns and to explain why makerspaces do belong in libraries. It’s great when schools have multiple makerspaces, whether or not they are called that. STEM labs, art studios, wood shops and other makerspaces all help to grow creativity in our students. But already having those spaces doesn’t mean we shouldn’t also have makerspaces in our libraries. No one would ever look twice at a school that chose to have multiple science lab classrooms or a gymnasium and a PE field and a workout room. So, if you’re on the fence or you’d like to know how to respond to skeptics, read through the five benefits below to learn how makerspaces in libraries can benefit our students. The school library has long been a central hub for all students in schools. Libraries provide resources freely to our students, regardless of their academic standing, what classes they take or what teachers they have guiding them in the classroom. Any student can come to the library to get the help and resources they need to be successful. In the past, this meant solely books and periodicals. Then computers, online databases and digital citizenship guidance were added. Makerspaces are next in the evolution of resources that we provide for our students. It’s true that many students can get these resources in their STEM labs. But not every student takes those classes. Not every student has a teacher who will take the class to use the classroom makerspace. And many (but not all) STEM labs focus more on the science and technology aspect of making and less on creative arts experiences. Meanwhile, the library is accessible to everyone. We need to bridge the gap and provide resources to all our students, and these resources include makerspaces. Play has long been criticized in education, especially as the grade levels rise. But there is a great deal of research available on play and its value in education. Children and young adults (and regular adults too) can learn through play. What often looks like “just play” to adults is actually a reflection of much deeper learning. Two students building a house together out of LEGOs are learning collaboration and teamwork. A student designing and redesigning his project to get it just right is learning about the design process, innovation and critical thinking. A student sharing the story behind the K’NEX® space station she built is expressing storytelling and creativity. Students build skills through play that help them in their academic success. They build creativity and imagination and innovation. Makerspaces in school libraries provide far more than “just play”; they provide a plethora of learning opportunities. 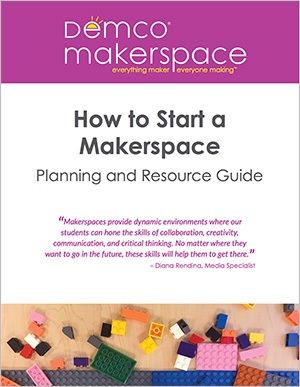 Download Demco’s How to Start a Makerspace Guide for tips on funding, getting buy-in, low-tech and high-tech tools and more. Makerspaces can absolutely connect to your curriculum. Students can take concepts they are learning about in their academic classes (e.g., electricity) and apply that knowledge to projects they are working on (such as creating circuits and explaining to a younger student how littleBits™ work). There really are endless ways you can connect makerspace projects to your curriculum and to literature. One of the best ways to ensure you make these connections is by collaborating with classroom teachers. If you meet with resistance, get them excited by conducting mini workshops or maker stations during professional development days. Or recruit a particularly creative teacher to work closely on a project that ties to his or her curriculum and let word of mouth do the talking for you. Before long, you’ll have interested teachers clamoring to collaborate with you. As for test scores, it can be hard to draw a direct correlation between makerspaces and test score data. But academia has begun more research on makerspaces. MIT is working on developing assessments to help create data on the educational value that makerspaces create. No, we can’t say with certainty right now that makerspaces will raise your test scores. But we can say anecdotally that they will increase collaboration, creativity, communication and critical thinking in your students, which certainly won’t hurt your test scores and which we know to be skills our students will need in the 21st century workforce. 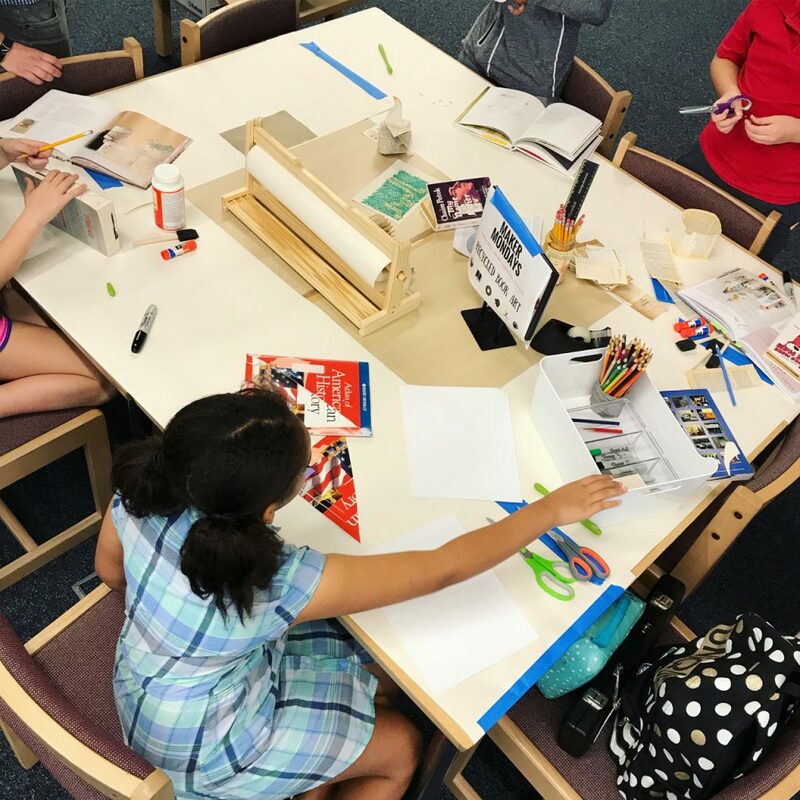 Let’s be clear: A makerspace does NOT and should not replace the library — makerspaces enhance and add to the library program. And we certainly don’t want to get rid of all the books. Literacy and makerspaces can happily go hand-in-hand. Some librarians fear that starting a library makerspace will have a negative impact on circulation, but I’ve seen the opposite. More students are drawn into the library by the makerspace. They stop at book displays and get interested. They talk to other students in the space who they normally don’t socialize with. They check out books related to the projects they’re working on. Yes, once upon a time, libraries were quiet places for individual study. We had wooden study carrels, heavy tables, tall stacks and the stereotypical librarians who angrily shushed everyone. But this does not apply to the libraries of today. Yes, we still provide space for quiet individual study, as there are students who need that environment. But more and more active learning is happening in our schools and in our libraries. Our students are collaborating on projects. Teachers are creating units where students can do more than just write papers or create presentations. Our libraries need to support this style of learning and makerspaces can do just that. Will it get loud sometimes? Yes. Will it be messy? Yes, but you can teach your students to tidy up just like art teachers have been doing for decades. Is it worth it? Absolutely. Whether you are the one defending creating a makerspace or the one looking to be convinced, the most important thing is to frame everything in a student-centered light. We want to create dynamic learning environments where our students can thrive. Shouldn’t a library makerspace be a part of that? You can click on the “Download Now” button above to download the guide. We hope it helps you on your maker journey!